Standardization is an important aspect to develop society’s trust toward UMY. 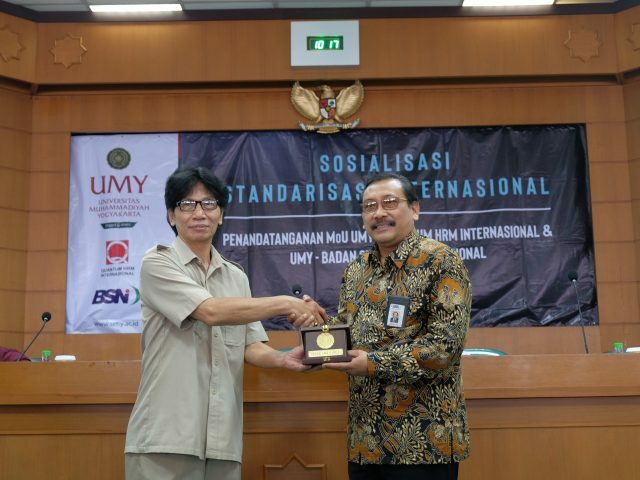 In a way to reach the standard on developing students’ academic, UMY signs a MoU with Quantum HRM Internasional and a MoU with BSNi (Badan Standardisasi Nasional) as those institutions are focusing on assessing personal and institution standard. Therefore, in the near future, it hopes that UMY will be the role model for all private university in Indonesia on lecturers and alumnae standardization. On April 16th, 2018, the MoU signing session was attended by Dr. Ir. Gunawan Budiyanto, M.P. 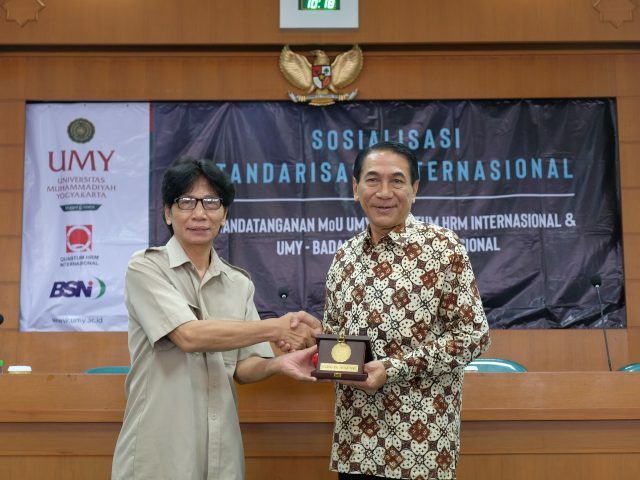 as UMY Rector, Dr. Sukamta as UMY Vice Rector I, Prof. Dr. Ir. Bambang Prasetya, M.Sc. as Director of BSNi, Prof. Dr. Pribadijono. M.S. as the founder of Quantum HRM Internasional, and all coordinator staff of UMY. In the session, holding at Gedung Ar. Fachrudin, Lt.5, Dr. Gunawan stated that with the standardization it is hoped can give a more specific standard for the alumnae in order to face the challenges in the global competition before them. He also added the event will increase public trust on UMYs’ academic system. Director of BSNi, Prof. Dr. Bambang Prasetya, M.Sc. was expressed both his happiness and proud toward the MoU session which successfully held by UMY. “The establishment of this cooperation could give more understanding on a standard of competence to university students. It is important for the student to acknowledge this standard in regard to realize their own competence when they were about to find a job once they are graduated” he added. On the same occasion, Prof. Prabidijono, Ir., M.S. as the founder of personal certification institute HRM Quantum Internasional said that UMY in all this time already printed plenty of Muslim cadre which has high intellectuality. UMY as one of Muhammadiyah higher education also has an excellent reputation and standardization, added by Pribadijono.